As snow and rain fell across much of southern Wisconsin on New Year’s Eve, 2018 ended in keeping with precipitation totals throughout the year. Madison experienced its second wettest year on record. Its 50.64 inches fell about 2 inches shy of the record set in 1881, according to data from the Wisconsin State Climatology Office. Milwaukee had its third wettest year, with 45.08 inches this past year, and La Crosse, with 42.59 inches, had its fifth wettest. In 2018, the southern half of the state saw about 125 percent more accumulated rain and snow than average, according to assistant Wisconsin state climatologist Ed Hopkins. 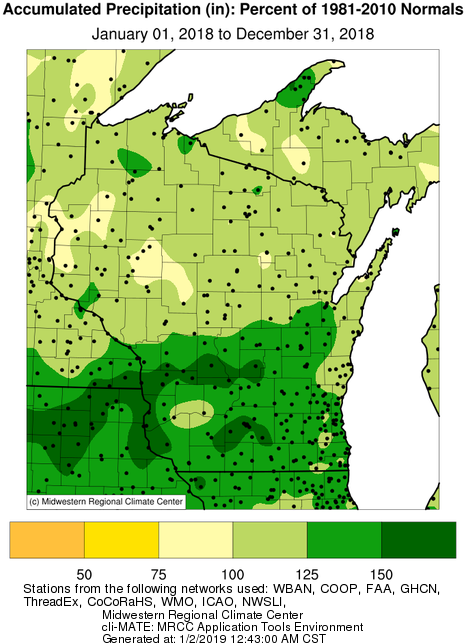 "There were certain areas in southern Wisconsin that were extremely wet, but you look up to northern Wisconsin, and while it was not drought conditions, it was below average precipitation for the year," he said. Hopkins said that, overall, the state has experienced a marked, upward trend in annual precipitation, which he partially attributes to a warming climate. Since the 1960s, annual totals have increased by about six tenths of an inch every decade.